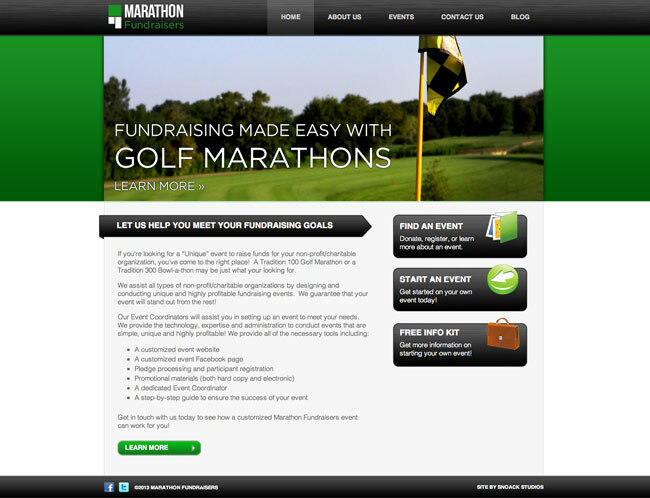 This new company in Grand Forks, North Dakota helps companies and non-profits raise money through golf marathons. Their company site needed to be clean and professional for investors and potential clients, as well as sleek and sporty to tie in the sports nature of their services. We used a bright color palette to keep the look clean, fresh, and visually appealing. The site itself has a lot of depth with the gradients and shadows that are used throughout, as well as headlines that extend beyond the content area. Overall the site is clean, organized and easy to navigate for the companies that want to get started with their services quickly and easily.